We've got lots of unlimited! (SPOT.ph) There seems to be no stopping all the eating, especially since Christmas is fast approaching. This week, we rounded up your favorites and they're on unlimited deals! Check out the eat-all-you-can burger, bacon, and dim sum that we found. 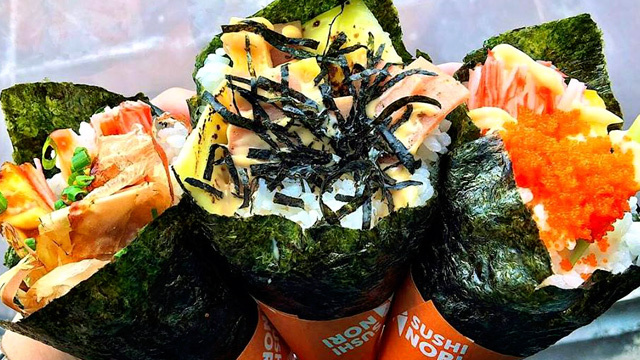 To complete your food trip, there are bottomless drinks, too! Meet Hogs and Cattle’s new baby: The Wagyu Burger. For just P349, indulge in all the Wagyu burgers that you can eat, which comes with bottomless iced tea. Plus, you get to stuff your own burgers with unlimited toppings and condiments! This irresistible offer is available on weekdays from 11 a.m. to 6 p.m.
Hogs & Cattle is at G/F Century City Mall, Kalayaan Avenue, Makati City; and G/F Entertainment Mall, SM Mall of Asia Complex, Pasay City. For more information, log on to Hogs & Cattle's Facebook page. 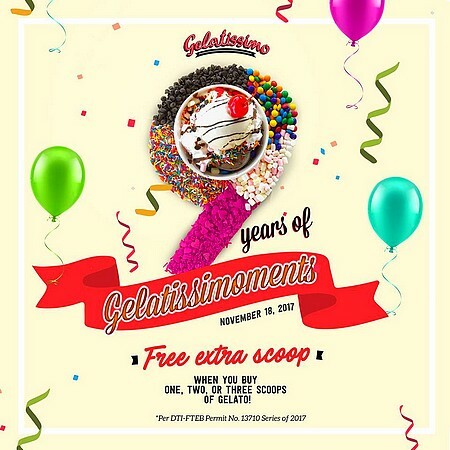 Join Gelatissimo in celebrating nine years of Gelatissimoments! Just for today, get an extra scoop for free (!!!) when you buy at least one scoop of gelato. Don’t miss this sweet treat! See a list of Gelatissimo branches. For more information, log on to Gelatissimo’s Facebook page. Mojito lovers, here's something that you can't resist and will surely enjoy with friends. 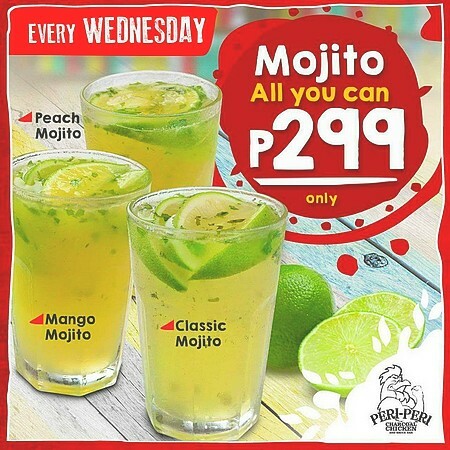 Drink to bottomless mojitos at Peri-Peri Charcoal Chicken every Wednesday for just P299. That’s one more reason to celebrate Hump Day! See a list of Peri-Peri Charcoal Chicken branches. 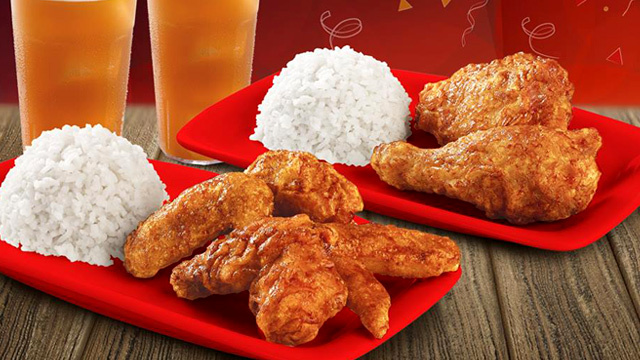 For more information, log on to Peri-Peri Charcoal Chicken's Facebook page. 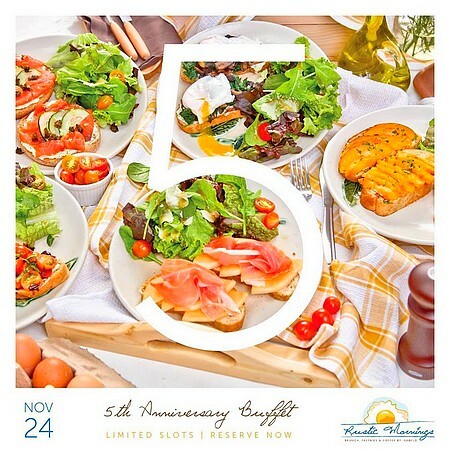 Enjoy classic Rustic Mornings dishes and new signature creations to celebrate their fifth anniversary. Limited slots are now available for only P555 per head for the following time schedules: 8 a.m. to 11 a.m., 11 a.m. to 2 p.m., and 2 p.m. to 5 p.m.
Rustic Mornings is at 11 Isabelo Mendoza Street, San Roque, Marikina City. For more information, log on to Rustic Mornings' Facebook page. 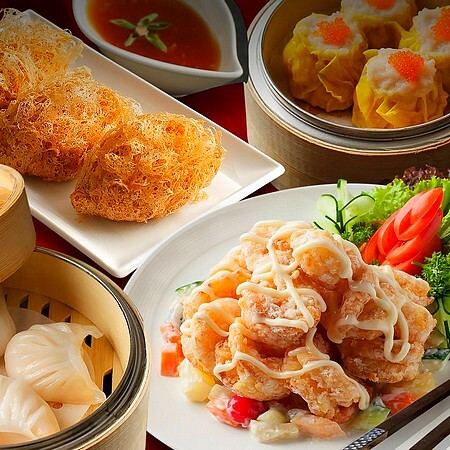 Enjoy all-you-can-eat dim sum, main courses, desserts, and other Cantonese favorites, served with bottomless iced at Passion at Maxims Hotel. This offer is available for P588 from Monday to Thursday and P688 from Friday to Sunday. You can have it for lunch or dinner, too! Passion is at 2/F Maxims Hotel, Newport Boulevard, Newport City, Pasay City. For more information, log on to Resorts World Manila's Facebook page. Enjoy a pair that's sure to pick up your mood at Krispy Kreme! 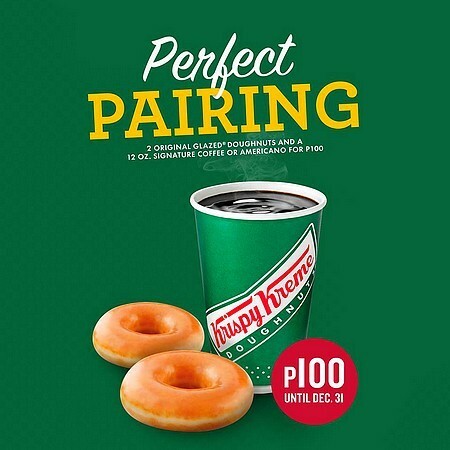 Have two Original Glazed Doughnuts and a 12-ounce cup of Signature Coffee or Americano for P100! Plan your coffee dates now because this promo’s available until December 31.
Who can resist bacon? (No one!) 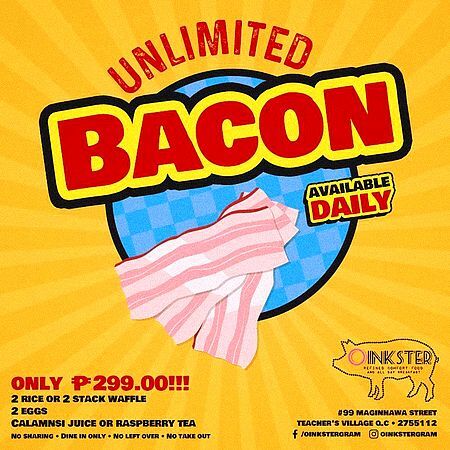 Now, there’s a lot more to go around with Oinkster’s unlimited bacon promo. For just P299, dig into all the bacon that you can eat, complete with two servings of rice or stack waffles, two eggs, and calamansi juice or raspberry tea. This irresistible offer is available daily! 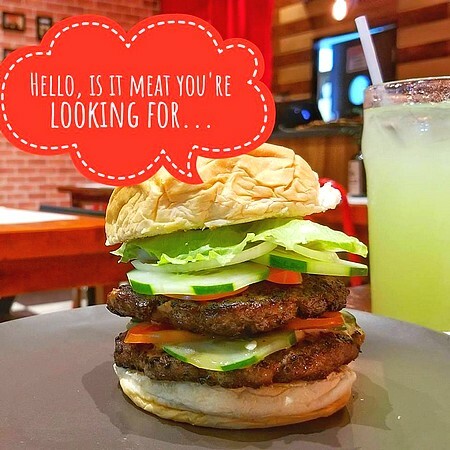 Oinkster is at 99 Maginhawa Street, Teachers Village, Quezon City. For more information, log on to Oinkster's Facebook page. 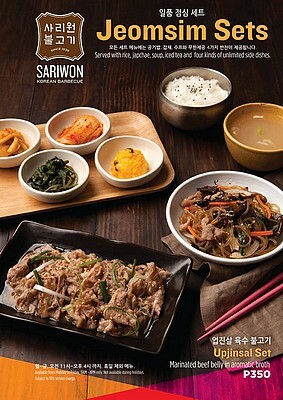 Check out Sariwon’s new lunch sets! Each set is good for one and comes with japchae, steamed rice, beef bone soup, a glass of citrus iced tea, and four refillable side dishes—all for just P350. These sets are available from Monday to Friday, 11 a.m. to 4 p.m.
Sariwon is at Bonifacio High Street Central, 7th Avenue, Bonifacio Global City; and G/F Promenade, Greenhills Shopping Center, Greenhills, San Juan City. For more information, log on to Sariwon's Facebook page. Because kids deserve a treat! 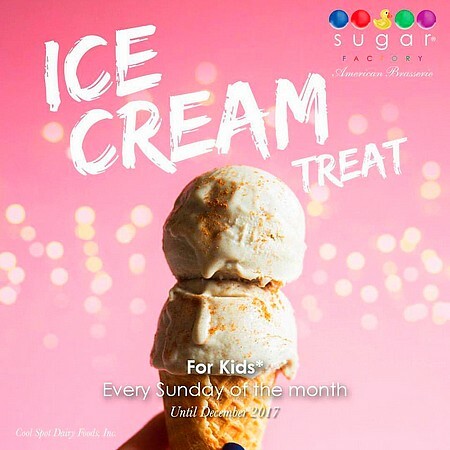 Sugar Factory is giving away free ice cream scoops to kids who will dine at the restaurant every Sunday. This sweet treat is available on all Sundays until December. Sugar Factory is at G/F Shangri-La at the Fort, 3rd Avenue, corner 30th Street, Bonifacio Global City. 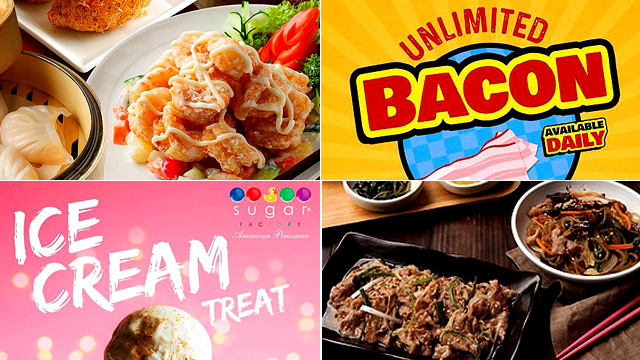 For more information, log on to Sugar Factory's Facebook page. 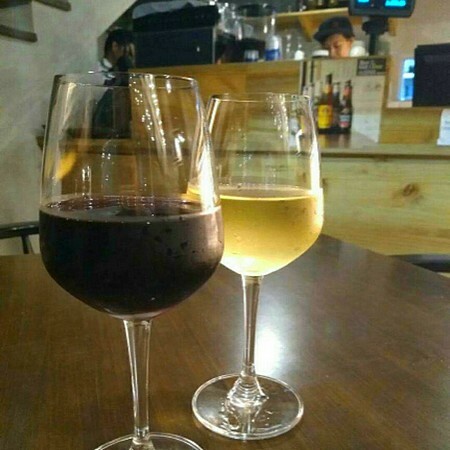 Your wine nights are about to get more frequent! For P399, raise your glasses to unlimited wine at Vanderlust. This offer is available every day, except from 6 p.m. to 8 p.m.
Vanderlust is at 100 Scout De Guia corner Tomas Morato Streets, Quezon City. For more information, log on to Vanderlust's Facebook page.